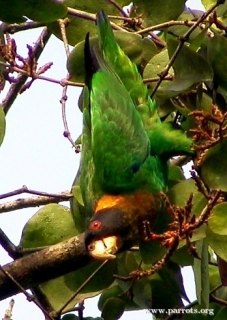 The head of the juvenile Caica Parrot lacks the stunning black mask of the adult. Both adults green in general; black/brown head; yellow/brown wide collar around nape and hindneck, with dark brown scalloping; olive/brown throat and upper breast; green bend of wing, carpal edge and underwing coverts. Bill horn in colour. Eye ring bare and pale grey. Eye orange. Green occiput and crown; olive/green cheeks; yellow collar around hindneck, scalloping absent; green throat and upper breast with olive/yellow wash. This bird is not very vocal; any calls made in flight are nasal or hornlike. When perched a nasal, honking sound. Inside enclosure 2 x 2 x 3m (6.5 x 6.5 x 9.8 ft). Fruits such as: apple, pear, banana, oranges, pomegranate, cactus fruits, mango, papaya; vegetables such as: carrot, celery, green beans, peas in the pod; lory nectar or porridge; small seed mix such as: millet, canary, safflower, oats, and a little hemp and sunflower; sprouted seed in spring and summer; vitamin and mineral supplements particularly C; complete kibble if taken. Provide unsprayed, bird-safe flowering and budding branches. Also wooden block toys, vegetable tanned leather toys and heat sterlized pine cones. Is susceptible to accelerating deforestation in the Amazon Basin as land is cleared for cattle ranching and soy production. It may also be vulnerable to hunting and persecution. E Amazonia in Guianas, N Brazil, and E Venezuela. Found up to 1100m (3608 ft) in lowland terra firme rainforest, sometimes at forest edge. Feeds on seeds of Dracoides sagotianu, Protium, and Brosium spp. Social. Mainly seen in small groups outside of breeding season. Birds forage in tree tops. Mainly keeps to upper canopy but may be seen on single bare branches projecting up and above canopy.